At a distance of 37 kms from the famous Nirmal town, you will find this enthralling waterfall. This beautiful waterfall is the deepest of all the waterfalls in Telangana. This is also a caution to people who wish to take a dip in it. The location is very secluded and surrounded by picturesque locations and scenic environment. 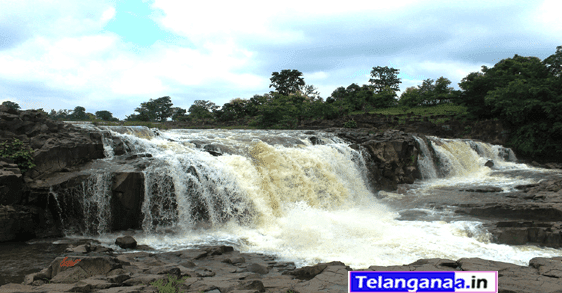 The waterfall has great width and height to make it the deepest in Telangana. The fall is 20 meter high and flows down with a great force, and the falls are categorized as plunge waterfalls. The holy river Godavari flows through the Sahyadri mountain range and on their way, the river breaks into small streams. Some of these streams escape from their path and meet at a point and become the source for the Pochera falls which falls from a 20 meters high point. The bed is much deeper and has the capacity to hold a very huge quantity of water. We can hear water roaring at a high pitch, exhibiting the power of nature. This place may scare you during night with only the moon lighting it up. The waterfall which is extremely beautiful and very scary at the same time is one of its kinds in the entire state and is rarely found in the country. The bed of the waterfall is made of hard Granite. This hard material holds the strong falls with elasticity and gravity. The lush green forest around the waterfall makes it a natural habitat for reptiles, bird species, and many insects. This falls serves as a good adventurous location. The greenery around the location is very appealing and is untouched by the urbanization. Adding spiritual touch to the beautiful location is the Narsimha swamy temple located near the waterfall. Pochera Waterfalls is located at a distance of nearly 37 km from Nirmal town, 47 km from Adilabad town and 7 km from Boath and accessible by road. Nirmal town, located 37 km away has many eateries and restaurants for tourists.